He responded to the mayor's criticisms by citing her "poor leadership ability", and also took aim at other officials in the US territory who he said had not been able to "get their workers to help". External Link: Donald Trump on Twitter: The Mayor of San Juan, who was very complimentary only a few days ago, has now been told by the Democrats that you must be nasty to Trump. External Link: Donald Trump on Twitter: ...want everything to be done for them when it should be a community effort. 10,000 Federal workers now on Island doing a fantastic job. The US leader said military responders working on the island deserved praise due to the extent of the damage in Puerto Rico, and accused US media organisations of criticising the emergency response in order to "get Trump". Ms Cruz, who has been living in a shelter after her home was destroyed in the hurricane, told MSNBC in response to the president's tweets that the issue was not personal. As Puerto Rican officials and the federal government continue to grapple with the massive devastation across Puerto Rico caused by Hurricane Maria, attention has turned away from the $73 billion debt crisis that is plaguing the island. But it’d be wrong to try and treat the two problems as distinct, says San Juan-based reporter Luis J. Valentín Ortiz. Working for Caribbean Business, he has been covering Puerto Rico’s financial crisis in detail for more than two years and knows that the two crises are inextricably linked—which makes fixing them both that much harder. Among the finest and most thoughtful commentators plying the trade these days is David Brooks of the New York Times, whose columns are always packed with value even when they’re off-base. Case in point is his Tuesday piece suggesting that those bent on thwarting Donald Trump have been going about it all wrong. Brooks notes that Jeb Bush sought to outlast the New York billionaire, giving him time to destroy himself. Marco Rubio and Hillary Clinton went the denunciation route, attacking his character. Paul Ryan tried to use him as a presidential ally with a handy pen for signing legislation. Mitch McConnell endeavored to outmaneuver him by constricting his power and reach. The result, writes Brooks, is that the Republican Party “is becoming a party permanently associated with bigotry.” Unfortunate turn of phrase. It puts Brooks in the camp of elitist scolds who denigrate their opponents as unworthy of American democracy, not unlike Hillary Clinton with her “basket of deplorables.” In fact, that sentence puts Brooks closer to Hillary Clinton in outlook than he is to the people he should be writing for as a Times columnist who’s designated a “conservative” (at least he was when he was given the column). And on Saturday Night Live, a golf shirt-clad Alec Baldwin spoofed Mr Trump, saying: "We want to help you, but we have to take care of America first." Ms Cruz, played by Melissa Villasenor, asks: "Wait. You do know we're an American territory, don't you?" To which Baldwin-as-Trump gasps and replies: "I mean, I do but not many people know that." AMY GOODMAN: This is Democracy Now!, democracynow.org, The War and Peace Report. I’m Amy Goodman. This week marks five months since Hurricane Maria battered the island of Puerto Rico. The island is still facing a massive recovery effort. While the official death toll is just 64, it’s believed more than 1,000 people died since the storm struck September 20th. More than a quarter of the island remains without power, marking the longest blackout in U.S. history. Wide swaths of the island were recently plunged back into darkness after an explosion and fire at an electrical station, sparking fears about the vulnerability of the Puerto Rican electrical system. Meanwhile, the Federal Emergency Management Agency, known as FEMA, is facing criticism after it was revealed only a fraction of the 30 million meals slated to be sent to the island after Hurricane Maria were actually delivered. FEMA approved a $156 million contract for a one-woman company to deliver 30 million meals. But in the end, FEMA canceled the contract, after she just delivered 50,000 meals, in what FEMA called a logistical nightmare. Well, on Friday, Democracy Now!’s Juan González and I spoke to the mayor of San Juan, Carmen Yulín Cruz. I started by asking her what the situation on the island is, five months after Hurricane Maria hit. MAYOR CARMEN YULÍN CRUZ: We are facing putting together a massive recovery effort. And that is part of the problem. It doesn’t seem—wheels are spinning, but things don’t seem to get off the ground. The botched effort continues to be deciphered. Fifty-five percent more—increase in the suicide rate, which tells you the mental state where people are at because of the dire situations and living conditions that we’re still in. A new Harvard study published Tuesday in the New England Journal of Medicine estimates that at least 4,645 deaths can be linked to the hurricane and its immediate aftermath, making the storm far deadlier than previously thought. Official estimates have placed the number of dead at 64, a count that has drawn sharp criticism from experts and local residents and spurred the government to order an independent review that has yet to be completed. The Harvard findings indicate that health-care disruption for the elderly and the loss of basic utility services for the chronically ill had significant impacts, and the study criticized Puerto Rico’s methods for counting the dead — and its lack of transparency in sharing information — as detrimental to planning for future natural disasters. Back in October, there was a report that there were more than 900 bodies that were cremated in the wake of the hurricane that had never been examined. If the study’s estimate is even close to accurate, that was just a fraction of the overall death toll. The conservative estimate of 4,645 deaths is a measure of how truly catastrophic the hurricane was for Puerto Rico and how woefully inadequate the response to it was. We knew that Puerto Rico was going through health and environmental crises following the hurricane that devastated the island, and we could see at the time that the response was slow and insufficient, but now it appears that things were much worse than we knew. PRESIDENT DONALD TRUMP: Now, I hate to tell you, Puerto Rico, but you’ve thrown our budget a little out of whack, because we’ve spent a lot of money on Puerto Rico. And that’s fine. We’ve saved a lot of lives. If you look at the—every death is a horror, but if you look at a real catastrophe like Katrina, and you look at the tremendous hundreds and hundreds and hundreds of people that died, and you look at what happened here with really a storm that was just totally overpowering—nobody’s ever seen anything like this—and what is your—what is your death count as of this moment? Seventeen? PRESIDENT DONALD TRUMP: Sixteen people certified. Sixteen people versus in the thousands. You can be very proud of all of your people, all of our people, working together. Sixteen versus literally thousands of people. JUAN GONZÁLEZ: With a death toll of at least 4,645, Hurricane Maria would become the second-deadliest hurricane in U.S. history, behind only the Galveston Hurricane of 1900, which killed as many as 12,000 people in Texas. The Harvard study surveyed almost 3,300 randomly selected Puerto Rican households and found mortality rates leaped 62 percent from September 20th through the end of 2017, compared with the prior year. Researchers counted not just deaths directly from storm injuries such as falling debris, but also those who died due to storm-related delays in medical treatment for injuries, infections and chronic illnesses. President Trump once again attacked politicians in Puerto Rico Tuesday, tweeting “Puerto Rico got $91 billion for the hurricane, more money than has ever been gotten for a hurricane before. And all their local politicians do is complain and ask for more money. The politicians are grossly incompetent,” he wrote. “They spend the money foolishly or corruptly, and only take from the USA,” he said. 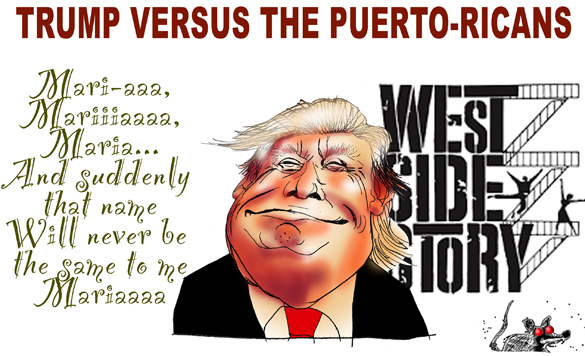 Trump also singled out San Juan Mayor Carmen Yulin Cruz when he tweeted “The crazed and incompetent mayor of San Juan had done such a poor job of bringing the island back to health. $91 billion to Puerto Rico and now the Dems want to give them more, taking dollars away from our farmers and so many others. Disgraceful!” he wrote. Well, Mayor Carmen Cruz had a very respectful response to the president. CARMEN YULIN CRUZ [CLIP]: First of all, Mr. President, 3,000 Puerto Ricans died on your watch. They died because your government was inefficient, ineffective, and unable to do its job. Secondly, again, you should fire whoever told you $91 billion were given to Puerto Rico. As you just mentioned, the Washington Post says between 11—our estimate is between $11-13 billion. There are still 30,000 people with rooftops that are not good enough. If a tropical storm comes, we have to take all of those people out of harm’s way. We have $600 million that the president is holding hostage because his vanity is much higher than his humanity is. $600 million to feed 1.3 million Puerto Rican people. Sen. Bernie Sanders and Congresswoman Julia Velasquez have put forth a plan just to feed people. So what kind of a man is he that he looks the other way when people need to be fed? SHARMINI PERIES: Well, she joins us today, right here on The Real News Network, the mayor of San Juan, Carmen Yulin Cruz, with us. She joins us from Puerto Rico. Carmen Yulin Cruz, Mayor, I welcome you to The Real News. CARMEN YULIN CRUZ: Thank you so much. SHARMINI PERIES: Mayor, you are in a Twitter war with the president, and all of this because the Senate failed to pass bills that would have provided additional aid to Puerto Rico on Monday. Then the Senate could not muster enough votes, which is 60 votes, in a procedural motion to approve $600 million for food stamps, because the Democrats said this was not enough to address the issues faced by Puerto Ricans. Now, $600 million seems like a lot to people. Why is it not adequate to address what the Puerto Rican people are facing at the moment? CARMEN YULIN CRUZ: Well, first of all, the president continues to tweet his hate and his ignorance out to everybody. No, Mr. President, $91 billion have not been sent to Puerto Rico. And he makes it sound as if it is a prize. You have two terrible hurricanes that devastated your island, and you have gotten—that’s the way he said it—$91 billion. Not only does he lie, but he has the amount completely wrong. According to the Washington Post, it’s about $11 billion. Now, what we’re talking about is money that has been promised to Puerto Rico but has not been delivered to Puerto Rico. A lot of—much to do about not so much. Number 2, this is classical Donald Trump. He tries to pin people against one another. This is what we’re talking about: 1.3 million Puerto Ricans out of 3.2 million Puerto Ricans that live in Puerto Rico are under the poverty level and require food stamps in order to put food on the table and not starve. That is exactly what we’re talking about. Now, the president continues to be ignorant about what the Puerto Rican people need, and continues to say that it’s too much money. Not only that, he seems not to even trust his own government. For example, FEMA money that has come to Puerto Rico as a reimbursement is money that is audited by FEMA. So FEMA doesn’t give you anything that they don’t think should be eligible for reimbursement. So this $600 million is money that is needed; 85% of the Puerto Rican population is in dire need of this assistance. Now, out of this, plenty of them are children. Plenty of them are elderly, and plenty of them are handicapped people. And I want to correct myself. It’s 45% of the Puerto Rican population. Now, the president does two things that are horrendous. One is he uses people’s suffering to hold them hostage. We will all remember a couple of weeks ago when he said “I want the money for the wall,” he didn’t get the money for the wall, and he left out of work 800,000 federal employees. If he doesn’t get what he wants he throws a little temper tantrum and he tries to put people down. And the other thing is that assistance, things that people need to breathe, to be alive, to survive, should never be weaponized and should never be used as a carrot, so to speak. But that’s what the president does best, tries to put people at odds with fake news that comes out of his mouth, and with totally ignorant comments that really are shameful to the presidency and to himself. SHARMINI PERIES: All right, let’s talk about that $91 billion he claims that Puerto Rico received. And there’s been various studies proving and showing that that is not the case. Give us some details in terms of how this committed or allocated money never arrived in Puerto Rico. CARMEN YULIN CRUZ: Well, one of the things that is very important is FEMA keeps changing the rules of engagement. For any other situation where there’s a climate change-related catastrophe or any type of devastation, FEMA initially would give 50% of the money that you certify, just through a letter. And they would give 50% before. Well, remember, there was Irma, then there was Maria. And FEMA somewhere in the middle changed the rule and said, you know what? That’s only going to be for Irma. For Maria we’re going to give you 50% up to $1 million. Now, they continue also to change the systems, the systems where you have to input the data. And now, this is recovery money, right, the money that comes from picking up debris or vegetative material. This is what they call Category A and B. We’re getting close to the second year anniversary of Irma and Maria, and still that part has not been given completely to the Puerto Rican municipalities. We haven’t even begun from Category C through G, which are the categories which allows you to clean up any debris that’s in the water systems, or, for example, bridges, roads, or any facility. In the case of the municipality of San Juan, there are 487 facilities that need to be looked at by FEMA in order for them to certify the damage and then give the money in order to go ahead and fix them. At the rate they’re going—and hopefully, I had a conversation with some FEMA people this afternoon, and they’re going to amp up what they’re doing. But at the rate they’re going till today, it’s going to take them 5 years and 10 months to review those 487, of which they have only reviewed so far 57. That’s only for the municipality of San Juan. You can imagine how much further back this system is going to take all over Puerto Rico. Now, all of this money that we’re talking about, that he’s talking about, this is what it would take for Puerto Rico to come out of every difficult situation that happened during both hurricanes and as a result of both hurricanes. But he just doesn’t know what’s going on in his own administration, and his lack of leadership is really forcing him to lie in order to save face. SHARMINI PERIES: Now, Trump also singled out San Juan Mayor Carmen Yulin Cruz when he tweeted “The crazed and incompetent mayor of San Juan has done such a poor job of bringing the island back to health; $91 billion to Puerto Rico, and now the Dems want to give them more, taking dollars away from our farmers and so many others. Disgraceful!” he wrote. CARMEN YULIN CRUZ: Well, on our part we don’t want to defend ourselves at the cost of somebody else. And let me tell you, a couple of weeks ago, the resident commissioner of Puerto Rico said, “Mr. President, I support the wall. And I’ve done so publicly. But don’t take the money for Puerto Rico. Take everybody else’s money, but not the money for Puerto Rico.” That’s totally ludicrous. That’s not the way to ensure that a dignified path going forward amongst all people. This is not about shared citizenship. This is about a shared humanity. There are people in a reservation in Pine Ridge right now that are clamoring for the same thing that I was clamoring for the people of Puerto Rico in September, October, November of 2017. But this is classic Donald Trump. Donald Trump likes to pit people against each other. And I repeat, the suffering of people should never be weaponized. The suffering of people and the need that people have in California, in Pine Ridge, in the Midwest, should never be weaponized. And the president just—there is money to go around. But the president has to understand that his role is not to be the divider in chief. It is to be the commander in chief. His role is not to pin people against each other. His role is to unite people through the thread of common humanity. But he doesn’t get it. He cannot get it done. So what he does is he attacks, he insults, he tweets his hate away. And it just, frankly, shows how embarrassing it must be for him to have to resort to such low tactics of pitting people against one another. SHARMINI PERIES: It’s very clear that President Trump doesn’t even realize that you were hit by Maria and Irma, because he keeps making reference to ‘a’ hurricane in Puerto Rico. Mayor, if you had a plan to address all the issues that people are facing in Puerto Rico, and had that $91 billion that you should have received, what would be your plan of action? CARMEN YULIN CRUZ: Well, there needs to be a complete overhaul of our electrical system. And that’s another program altogether. The current local Puerto Rican government is selling the Puerto Rico electrical power authority, which will give the private sector something like a monopoly in Puerto Rico for everybody. So they may or may not decide that it’s good for X or Y community or neighborhood to receive electricity just because it would be not profitable. That’s number one. Number two, all of our health systems, our hospitals, our diagnostic clinics, all of them, need to have solar generation systems. Because climate change is real, despite what the president continues to say. And this will bring stronger and faster hurricanes coming altogether. This is going to be a powerful situation that we have to deal with. And number three is the infrastructure, the bridges and the roads, which frankly make it very difficult for people and very unsafe for people to deal with. SHARMINI PERIES: And that was the mayor of San Juan, Carmen Yulin Cruz. I thank you so much for joining us today.